When The Queen Came To Town is now showing at selected Australian cinemas and is distributed by Umbrella Entertainment. For a list of participating cinemas, please see the official site and local guides for show times. When Queen Elizabeth II and the Duke of Edinburgh toured Australia in 1954, it was the biggest event the country had ever seen. Even today, it is still the biggest non-sport related event Australia has ever seen and involved more people than both the Melbourne and Sydney Olympics. Maurice Murphy's wonderful documentary, When The Queen Came To Town captures the jubilation that the country felt 60 years ago and gives the people of today a chance to understand what it meant and for the people who were there to reminisce a time of pure happiness. The film does a superb job at reminding one that despite a great deal changing since that time, some things manage to remain the same. 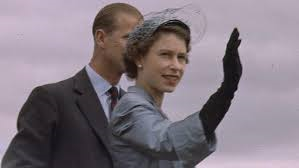 In 1952, Princess Elizabeth was in Kenya on her way to tour Australia with her husband, Prince Philip when she received the tragic news that her father, King George VI had passed away. Two years later and now as Queen Elizabeth II, she honoured the trip she had once planned and toured Australia and the South Pacific. The monarch was in Australia for nearly two months and travelled to not only the major cities including Sydney, Melbourne and Adelaide, but also several regional towns such as Newcastle, Wollongong, Wagga Wagga and Cairns. Three quarters of the population had turned out to witness the young queen and she was greeted by many young Australian children wherever she went. During this film, several of the people who were able to see the queen and also some who were able to have direct contact with her are interviewed and all reinforce how incredible the event was and how the queen left such a lasting impression on the country. When The Queen Came To Town is a beautiful documentary made with pure love and affection for the Queen herself and for Australia. Narrated by Bert Newton, it is a memory of an exceptionally joyous occasion in Australia's history and the film is a 78 minute celebration accompanied by bright, uplifting colours to reinforce this. It is an extremely well researched piece of work that isn't just a travel diary of the royal couple, but looks at Australia in the 1950's and also looks at what this royal tour meant to the people on a cultural level. The extensive actual colour footage of the royal couple is exquisite and if it wasn't for the obvious differences in landscape, could well be mistaken for recently filmed footage. This accompanied by the interviews with over forty Australians who were actually there to see the Queen provides an understanding of what life was really like and how the tour impacted Australia. It is said during the film that the tour made Australia feel like they were no longer a faraway land, but that the country mattered on a global scale. It is interesting to note that although Australia has changed a great deal since the 1950's, the way which people reacted to Queen Elizabeth II when she was 26 years old and Prince Philip was 33 is not unlike the way people relate to the Duke and Duchess of Cambridge. For the younger generation, it may be hard to envision how the Queen and Duke of Edinburgh were ever looked at in the same way as William and Kate, but this film is a snapshot of a time when the similarities are striking. It is not a comparison that is spoken of, but one that is impossible to ignore. The royal couple represented a marriage which many aspired to have which is one based on love, respect and commitment. At 26, Queen Elizabeth was young and beautiful, which inevitably led to her being a fashion icon. Her wardrobe was a talking point wherever she went and for two months she graced the cover of every women's magazine in the country. She arrived in Australia at a time when Australian women were wearing rather drab colours and her style of pastel and bright coloured dresses were immediately mimicked. 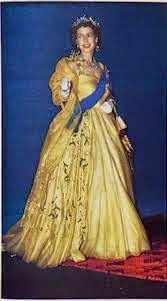 Although royalty has always played a part in influencing culture and fashion abroad, the young Queen was the first British monarch to ever visit Australia and this started the continents obsession with royalty which is not unlike celebrity obsession. People looked up to the Queen and her husband the way people look up to William and Kate. As this young royal couple visited Australian shores in the past year, the event itself was not on the same scale yet the interest in them as people is the same as it was sixty years ago. When The Queen Came To Town has been described as a film about the celebration of the British monarchy not just for royalists, just as the tour itself was embraced by royalists and non-royalists alike. The royal tour was an important and joyous event in Australian history and should be celebrated as it is in this film. When The Queen Came To Town is a culturally significant documentary which should be shown in all schools as a celebration of Australia's history.